ive been out of bowhunting for a few years, took up duck hunting and let that consume my hunting time. im looking to get back into bow hunting i used to shoot a fred bear assault, im looking into a cheaper setup for now. and have been looking at the pse brute x rts package, bear strike, and the diamond infinite edge. I dont have a lot of money to spend as im currently in college and these happen to fall into my price range. would anyone have any input on these bows…is one better than another? So I’ve been looking at pse targets and would like to know if anyone has tested both the Supra max and the Phenom. The phenom is 1.25" shorter but has the same brace of 7". Is it really worth the extra $ 200 for the supra. I like the look of the phenom more but will it be a decent target bow? I live in Oklahoma City and have been having trouble finding a good knowledgable person that knows bowtech bows well and who can set my bows up and tune them to perfection. Anybody know of anyone? I’ll fully admit I’m a FNG when it comes to Archery. I’m interested in recurves, want to do target shooting (not hunting) – maybe some day get into some competition if I’m able to make that transition, and I’m having some problems finding a good starter bow. I was looking at a Ragrim Impala takedown for me, and not really sure if it’s a good beginner recurve or not. Based on my height, @ 6’4" I’ll need a 30.5" Draw length(ish), so I’m looking @ a 70" bow? and given my weight (250 lbs), most charts say 50# draw should be my ultimate goal… but given I’m doing only target and not hunting that may be overkill. Plus being new, I know you should start lighter and work your way up, so should I be starting more in the 30-35# range? Price-wise it looks like a good entry level bow for someone who’s still going to be working on the fundamentals, but I also am constantly aware of the old adage ‘you get what you pay for’. This bow is dangerous. After shooting less than 400 arrows the riser on this bow snapped at full draw. I am lucky to be all right, all I got was a sprained thumb and a whack to the face. I only have the #50 bow not the #60 which is offered. I kept the bow in extremely good condition and I never kept it strung. I only have a 28" draw so the bow was not over strained. DO NOT BUY THIS BOW. I get a bit more concerned. Admittedly it’s just 1 review, so one can’t set a whole lot of stock to it, but I’d appreciate any help from the community that’s more familiar with Ragim and this bow, or if someone has a better choice/selection/suggestion, I’m all ears. Someone suggested I try this here rather than the general discussions as there were not responses there…. 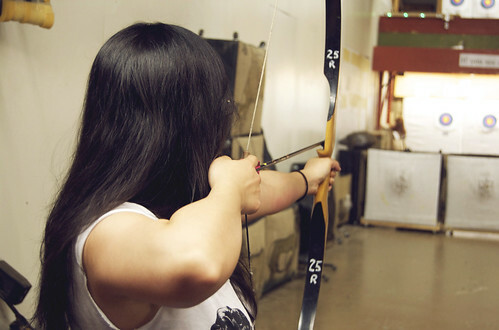 I know almost nothing about archery, but have decided I should learn how to shoot a bow, just because. My wife and her late father have two John Graham II signed DynaBos that were supposedly custom fitted by John Graham himself. When my Father-In-Law recently passed away, we brought the bows home thinking maybe I could use one to learn how to shoot and have some fun. However, it was stressed by someone with far more experience than I that I should not even consider pulling these bows until they were restrung. I took them to a local archery shop and asked for help. His first comment was that I should buy a bracket and mount them on the wall and look at them. Actually, he was kind of an *****. I don’t think he had a clue what he was looking at, and was not in the least interested in helping me. So, I’m looking for help. I need a manual, website, expert friend, etc, to help me learn more about what I have, find strings for them, figure out how to change them, or find someone who can change them for me. I’m in the Minneapolis area. I stumbled onto this forum site, and it appears there may be one or two people who know something about these bows. I am a 53-year old, 5’1", small-framed woman, strong for my age and build. I have been interested in archery for a long, long time and am finally doing something about it. I very recently got a 62" Ragim Wildcat takedown recurve rated at 28# @ 28". My measured draw length is 23.5" and I estimate my draw weight to be 19-20lbs. My goal is to become a competent instinctive shooter (rather than Gap or shooting with a sight), and am interested in competing in target archery tournaments and later (perhaps) field archery tournaments. I’m working on form right now (split finger) but routinely shoot high (about 25 inches at 10 yards) and to the left. My grouping is inconsistent – usually at least fair and sometimes very tight – obviously, my form still needs a LOT of work. To try to adjust the arrow elevation issue, I moved my bowstring nock point up from 1/2" to 3/4" and plan on changing my anchor to my middle finger (instead of index finger) to corner of mouth. Have not tested yet. 1516 cut down to 25" with Bohning T nocks, TrueFlite 2.5" feathers, and the Easton 1816 (63 grain) NIBB to add extra weight on the front end. Per the online calculator at http://www.goldtip.com/calculators.aspx these specs should give the arrows an FOC of around 8.8% and the total weight would be 110 grains lighter than the Genesis. Is my logic behind this arrow configuration valid? Any advice about equipment, form, practice exercises, etc? In the future I will be ordering a custom bow that I have always seen in my mind, but never in person. I am hoping to see a picture of what I am visioning. The riser is a very natural color. It looks "untouched" or "unfinished"
I do not know if it is ash, or hickory, or curly maple, or what. It is almost a cream look maybe. An off white. If any of you have pics of bows that resemble this description, could you please post them along with what wood is used?